STEPHAN BROWN | YOU'RE U.S. - pronounced "you're us"
Of whom is this a portrait? We do—may—not know. A hunter, a pacifist, a solitary, a man with a clear sense of himself and his values. (Also, elsewhere, often, a companion.) Once, he placed himself in a darkness, a forgotten place. Here, he looks out from there. Here, his mind exceeds his shock of hair. Here, we see with him, a globe of glow. (Also a laugh.) His thumbs meet. A big, warm coat. Nerves. 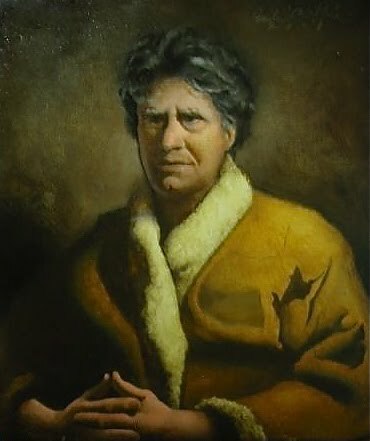 Of whom is this a portrait? Of Stephan Brown of Cape Cod, of a line Browns nearing 400 years. Of a husband, a father. Of an herbalist. Upon fifteen acres on the north side of the Cape, along the Olde King’s Highway, he farms medicinal and ornamental plants. He thanks each plant for what it gives. He says, please allow this plant to help me help others. But a mere one percent of one percent of the farm feeds and soothes Stephan Brown. For he is an herbalist for others. Yes, he offers you the medicinal herbs you do—may—not know this earth abounds in. Yes, the Alternative that was once—indigenous—the Blessed Norm. Yes, since 1991, Great Cape Herbs, a business, believed-in, guided: Our firm belief and our guiding proposition is that Herbs are the People’s Medicine. Of Stephan Brown, an herbalist who speaks to many people he has never met all at once. Spiritually. And literally. On his radio show, co-hosted by Eliza Travisano. Herb Talk. A message for us, simple, sweet. Herbs. Try. And listen. * Radio interview edited by Chris Hoff. * *Kyle Parry is a PhD student at Harvard in film and visual studies.